With students in India seeking more inter-disciplinary programs and flexibility in course curriculum, SRM university took to the next level the manner the programs are offered, and the curriculum is designed. This demand has been addressed by completely leaving the option of program path to the students. A student who is doing a Major in a subject shall have an option of choosing a specialization in the relevant area enabling him/her to learn courses across the discipline. The credits required for just a (i) Major (ii) Major with Specialization and (iii) Major with Minor may vary. Prerequisites will obviously be mandatory wherever it may be required. This gives the freedom for students to design their degree program, choose their course curriculum and decide their future career. This, with active learning and industry internship, will make our program a real 'Inter-Disciplinary Experiential Active Learning' (IDEAL). As a first step to creating this IDEAL environment, we have introduced the Major and Minor concept for students joining B.Tech degree programme from the academic year 2018-19 onward. The major and minor combination will vary from campus to campus depending on the offerings of the individual campus. We strongly believe that few Minors are going to have a Major impact in one's career path. The in-discipline areas will be "specialization." For example, a Computer ScienceMajor will specialize in cybersecurity or data science. The outside of discipline (Engineering or Non-Engineering) will be called as "Minor". Computer Science Major, having Minor in "robotics" will expand his/her horizon. A Civil Engineering Major can do "Minor" in Coding Logic or Biomechanics; An Electrical Engineering Major can do a Minor in "Hybrid Vehicle Technology" to explore a whole new area of career paths. All the Majors can be offered as Minors. An overview of Majors, Specialisation and Minors is provided below. A student will be awarded a Degree in a Major if he / she earns a minimum of 180 credits and satisfies all requirements for the award of the degree as per the University regulations. The student can choose courses from the list of departmental electives and open electives offered in a campus for the specific Major, to complete the 180 credit requirement. 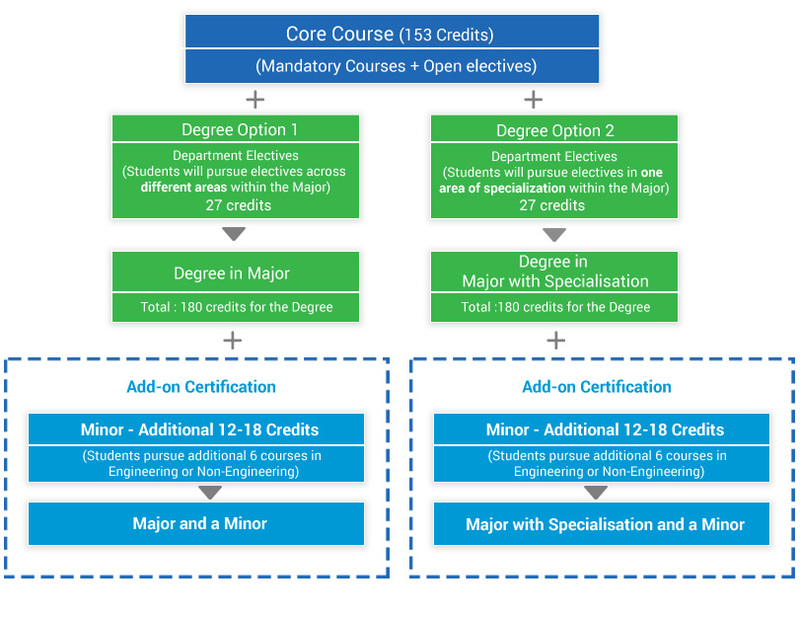 Degree Nomenclature: The degree will contain the Major like B.Tech in Computer Science and Engineering or B.Tech in Mechanical Engineering. A student can pursue a Major with Specialization, if he / she chooses to specialize in a sub-field relevant to his / her Major. This will allow them to deepen their learning in the said sub-field. To pursue a Specialization, the student must have taken a certainnumber of departmental / open electives from the same basket of intended specialization. For example, a student pursuing a Major in Computer Science and Engineering can specialize in Cyber Security, if he/she takes the required number of electives relating to Cyber Security. The exact number of electives to be taken from a particular sub-field to earn a specialization will be defined by the respective departments. Degree Nomenclature: The degree will contain the Major along with Specialization. For e.g.,: "B. Tech in Computer Science and Engineering with Specialisation in Cyber Security". Minor is an option rather than a requirementfor B. Tech students. They may opt for one of the below mentioned Engineering or Non-engineering discipline as Minor, earning additional credits. However, students are permitted to choose only one Minor either from engineering or Non-engineering discipline.In case of a Minor within engineering, it can be in any department other than the student's Majoring department. For instance, a Computer Science and Engineering student can do a minor in Electronics and Communication Engineering or Electrical and Electronics Engineering. And, in case of a Minor from outside Engineering, Computer Science and Engineering student can do a minor in Economics, History, or Journalism. This opportunity is ideal for students who took a Major out of necessity but would still like to pursue their passion in another discipline or to enrich/equip them for a specific profession where greater job opportunities exist. Another advantage of opting for a Major with a Minor is to earn standing credits for pursuing a Master's degree abroad or within India too. Only students who satisfy a set of minimum eligibility criteria set forth by the university and meet certain pre-requisites, will be permitted to opt for a Minor. Degree nomenclature: The degree will contain the Major / Major with Specialization. The Minor pursued by the student will be provided in the transcript along with details on courses completed and associated credits earned. For e.g., For a student who pursued Computer Science and Engineering with a Minor in Industrial Psychology, the degree will read "B. Tech in Computer Science and Engineering", Transcripts of B. Tech will reflect the Minor courses and the Minor certificate in Industrial Psychology will be issued separately. Minor is an option rather than a requirement for B. Tech students. They may opt for one of the below mentioned Engineering or Non-engineering discipline as Minor, earning additional credits ranging from 18 to 20. However, students are permitted to choose only one Minor either from engineering or Non-engineering discipline. This opportunity is ideal for students who took a Major out of necessity but would still like to pursue their passion in another discipline or to enrich/equip them for a specific profession where greater job opportunities exist. Another advantage of opting for a Major with a Minor is to earn standing credits for pursuing a Masters degree abroad or within India too. Only students who satisfy a set of minimum eligibility criteria set forth by the university and meet certain pre-requisites, will be permitted to opt for a Minor. The student who opts for a Minor and satisfies the credit requirements as per the regulations, will be awarded a Certificate in Minor in addition to the Degree in Major or Degree in Major with Specialization, as the case may be. Generally, the total credits to be earned will range from 192 credits to 200 credits.